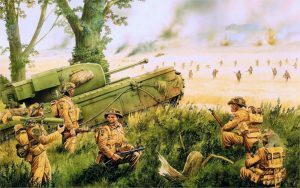 This scenario focus’s on the British 2nd Army’s ‘Operation Bluecoat’ that that supported the west flank of the Normandy beachhead (i.e. Operation Cobra). This attack was opposed by fringe forces from the German 7th Army & the LXXIV Korps of Panzergruppe West with the 276th Volksgrenadier Division defending west of the Drôme River and the 326th Infantry Division defending south east of Caumont. The scenario here specially involves 15th Scottish Division supported by the Guards Tank Brigade against the remnants of the German 326th Infantry Division along with a few units from the 654th schwere PanzerJager Abteilung. 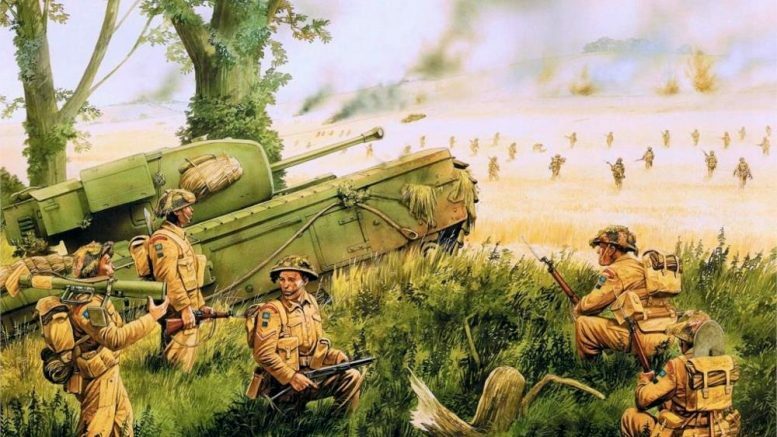 It is a fairly large battle and involves over two dozen Churchill heavy tanks supported by an infantry battalion with 4 rifle companies and a number of other miscellaneous units, while the German side consists of a remnant infantry battalion with 4 rifle companies, a Fusilier battalion with 3 companies, a remnant panzerjager company with a handful of ‘Marders’, along with a mixture of other infantry, anti-tank and flak guns. Note: although this scenario involve units from the 654th sPzJgr Abt., they play small, but important, role late in battle. I decided to minimize the involvement of heavy jagdpanzers to focus more on the conflict between the Guards/ 15th Scottish Division units vs the German 326th Infantry Division. 2 Comments on "Assault on Point 226"
What a challenge!! Probably not the greatest effort on my part, due to weak planning, but did have a plan. Was able to clear only two bocage objectives, and lost 27 tanks! Actually there are a lot of options, and a good scenario to learn to use all the tools. Thank you very much for the opportunity! Managed a Tactical Victory, but not proud of it – ha! Very cool scenario. However, the enemy is too easy to overwhelm. My Churchills had amazing kill numbers. But, I had fun! The surprise at the end was shocking. But, dealt with more efficiently than I thought….